Espresso machines that are built using a pump are among the most popular home coffee machines in the world. They are also the most common, because they are easy to use and produce great espresso every time. Below we detail the best pump espresso coffee machines on the market today. Not Surprisingly pump machine is powered by electricity, to force water through coffee grounds. Other types of espresso maker use the pressure from built-up steam or force from a manually-moved lever, but this is the most popular way to make espresso right now. These espresso coffee machines come in three sub types. Semi-automatics require you to do something – at least push a button – to start and stop the pump. This gives you more control over your coffee but also requires that you be present and actively watching the machine while it’s working. Many automatic machines also have this feature, though they will also make the coffee for you, on pre-programmed settings. You tell the machine how much coffee you want, and it does the rest. Finally, there are super-automatics. These will do everything for you, from grinding your grounds to the perfect size, to making the coffee, and they’ll even help you dispose of the grounds once the coffee is made. If you don’t want to have to worry about any piece of the puzzle, this is the type of espresso coffee machine you want at home. So What’s The Best Pump Espresso Machine For Home? If you really want to feel like a barista in your own kitchen, the Breville Barista Express will definitely give you what you need. The great news is that you don’t even have to be a professional barista. Thanks to the stylish stainless steel brand’s ease-of-use, anyone can make the perfect espresso at home with little or no experience. With this espresso coffee machine you truly will go from bean to buzz in 60 seconds. You grind the beans right in the Breville espresso machine before you brew and there are interchangeable filters and a choice between auto and manual operations to make sure your espressos and other drinks are always to your liking. There are fifteen settings on the bean grinder that will turn your beans from fine to coarse and everything in between. There is also an airtight bean hopper that will preserve your beans’ freshness and aroma. 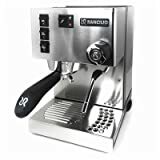 With 54 five star ratings on Amazon The Rancilio Silvia espresso machine is probably the best rated espresso machine for home use. Rancilio’s best known and best known espresso machine for home is the SILVIA which was first introduced in 1997. It was originally intended not for sale, but as a gift to vendors and international merchants of Rancilio products. 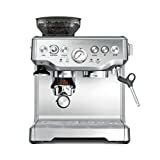 The Gaggia 14101 Classic Espresso Machine is Gaggia’s best espresso coffee machine, it is semi-automatic and it also comes in stainless steel. The chrome plated brass brewing components help to stabilize the unit’s temperature. There is also a three way solenoid valve, a 1425 watt boiler, dual heating elements for when you have company and a commercial strength pump so that you can make espressos just like they do in your favorite java hut. The frothing wand is very easy to use and there’s also a cup warmer so that your espresso is served at the correct temperature. 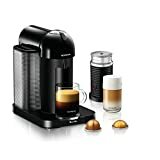 The EC155 from DeLonghi is an affordable and very flexible espresso coffee machine, as it can use both coffee pods or ground coffee, thanks to the dual-function filter holder. This means that preparing espresso can be as simple and fast as you want it to be, or you can grind your grounds yourself. It’s also easy to make lattes, cappuccinos, and other special drinks with this machine, as it has a swivel jet frother that makes the nice, thick foam that authentic Italian drinks are known for. It’s a durable machine, with a high-quality stainless steel boiler and 15-bar pump pressure. And for the life of your machine, you’ll be able to brew your espresso at the temperature that’s perfect for you, because the water and steam have separate thermostats and you can control both of them. This espresso machine for home is very similar to the last one, which shouldn’t be a surprise since they’re made by the same company. It, too, can use either coffee pods or coffee grounds, because it has a dual function filter holder. Additionally the DeLonghi EC702 provides a trademarked “Cappuccino Program” frother, which blends steam and milk to produce an ideal foam each and every time. If you love to make speciality coffee drinks as well as drink espresso straight, this is a great option for you. Again, you don’t have to worry about preparing for start-up with this espresso coffee machine, because it will handle that on its own. And you won’t have to worry about getting repairs done or replacing the machine, because it has a stainless steel boiler and 15 bar pump pressure, so it’s ready to make your coffee for years to come. This is a small espresso machine for home that many people have come to love. It’s not hard. After all, it comes with 19 bars of pressure, so it can pump water through coffee grounds better than most similarly priced machines on the market. It also uses coffee pods, so you don’t have to worry about preparation or cleanup, and you don’t need to be concerned about putting in enough grounds to get the coffee strength just right. Though it’s small, many consumers have found this machine to be mighty, too. It’s known for producing a drink that’s quite out of proportion with its diminutive size. These espresso machines are not necessarily “traditional” machines, but they get the job done and most espresso drinkers, even fanatics, find a cup of brew from these espresso coffee machines to be more than acceptable. China. One replacement after another was bad. Straight from the company, one thermostat did not work; one water line was kinked and therefore leaked. I had to cut the power cords and return these in order to receive a replacement, (yet I had to send in the original the first time, presumably so they could troubleshoot it and ensure my claims were valid, as it was still under warranty), but after four tries, I told the company to send the next one up in line of quality. This was the BAR32, with which I not had any issues after some two years. If I could find a comparable Krups, I would purchase that, assuming it was not made in China.